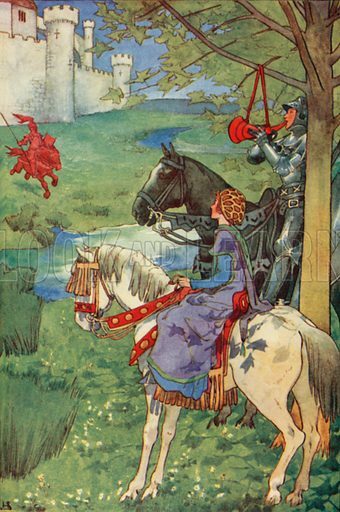 Helen Stratton was best known for her illustrations of children’s fairy tales and legends. Her work encompassed classics such as Tales from Hans Christian Andersen (1896), The Fairy Tales of Hans Christian Andersen (1899), The Arabian Night’s Entertainments (with others, 1899), Edmund Spenser’s Tales from the Faerie Queene (1902) and Grimm’s Fairy Tales (1903), amongst others. Helen Isobel Mansfield Ramsey Stratton was born in Norryong, Bundelkhand, Central India, in around 1867, the daughter of John Proudfoot Stratton (1830-1895), a surgeon who worked for the Indian medical service, holding various posts in Bombay, Baroda and Bundelkhand where he was appointed commissioner in 1862 and, from 1864, a political agent. He eventually retired in 1885 with the rank of brigade-surgeon. In 1859, he had married Georgina Anne Anderson, born in Afghanistan in c.1842, with whom he had six children. Georgina brought her young family to England shortly before the birth of her sixth child, who was born in Brighton in 1868. In 1871 the family lived at Magdella Villa, Henrietta Park, Bath, Somerset, and in 1881 were at 13 Widcombe Crescent, Lyncombe, near Bath. In 1891, Helen Stratton was an art student, boarding in Cromwell Road, Kensington. By 1901, she was working as an artist and living with her widowed mother and sisters Amy and Janet. She lived for many years at The Bungalow, Widcombe Hill, Bath, and died at Cran Hill Nursing Home, Weston, Bath, on 4 June 1961, aged 95. Many more pictures by Helen Stratton can be found at the Look and Learn picture library.